The chess clock, or as they are sometimes called, chess timers, are a standard piece of equipment for both club and tournament play. As chess players became more sophisticated and more competitive, they started taking longer and longer between moves to develop their strategies. This could really drag the game on for extended periods of time where some moves could take days. To solve this problem they needed a way to allow the players time when needed, but to cap the time so it was not abused. The solution was two clocks that were tied together and set for a specific amount of time for gameplay. If for example the game was allotted two hours of gameplay, the players could use as much, or as little, time as they wanted for each move so long as their total time did not exceed two hours. Developed in the early 1800s and first used in the 1883 tournament in London, these timers would eventually find their way into every tournament, clubs and even friendly games in the park. Today, choosing a chess clock is about finding what fits your needs, budget, and style. They are available in a wide range of types but generally fall into two basic types; analog and digital displays. The analog chess clock, or more correctly, analog display clock, is what most people think of in a chess clock. This is two clocks in one unit which has two analog clock faces, and two buttons on top, one for each player. These are available in both mechanical (wind up) and digital (battery/ac) movements. 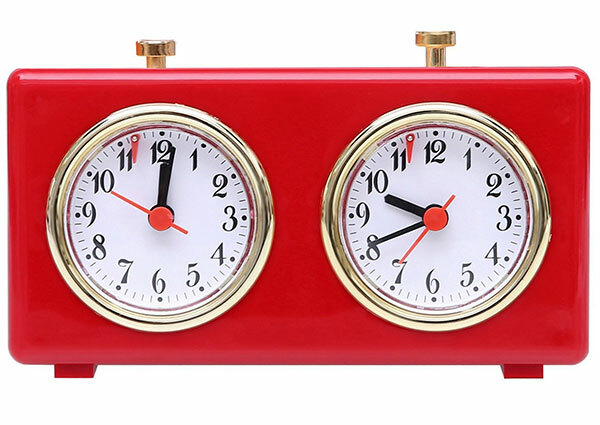 For a mechanical analog clock you could buy the Retro Shiny Red Chess Clock online for around $30 which tends to be a favorite. This inexpensive clock shows up quite regularly at chess clubs and small tournaments everywhere and is one of the most popular chess clock in store. It is small enough to stash in your chess bag but larger enough to see quickly at just over six inches long and three and a half inches high. Since this is a wind up clock, you never have to worry about batteries or AC outlets and cords. Simply wind and go. One word of warning is that virtually all mechanical chess clocks these days (except for the very high end) are prone to over winding. This is where you wind it so far that it actually breaks the springs inside and will no longer work. To prevent over winding, be sure to read the instructions that come with your clock or if there are none, simply let it run down all the way and then wind it one turn per side. Digital chess clocks come in a huge array of sizes, styles and prices. That is both good and bad because the less expensive models can be too small to see quickly and prone to failures. 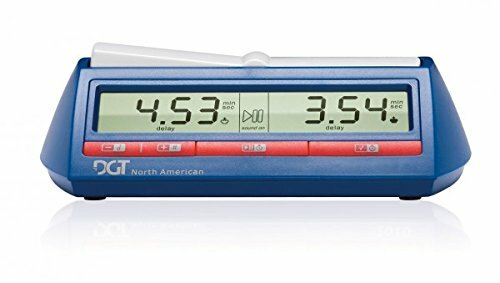 One of the best selling digital clocks is the DGT North American Chess Timer which runs around $38 or so. The DGT is fairly small at 7.5″ x 2″ x 4″ and is reasonably easy to see (sorry, I find the analog clocks faster and easier, but that is personal preference). It carries an excellent two year warranty and has more options than you can shake a stick at. 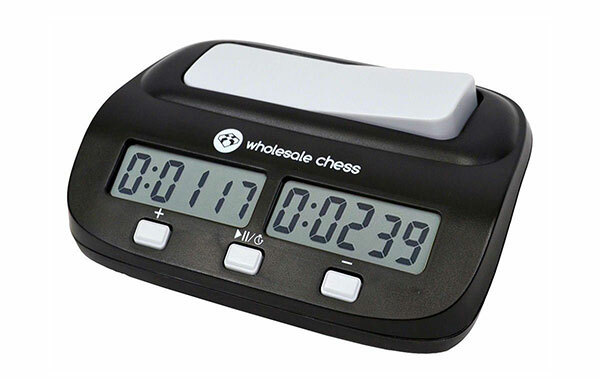 If you want something a little more basic for a student or someone just staring out on a budget, check out the Wholesale Chess Basic Digital Clock for around $19. This should have every option you need and last you for a long time. I hope this article helps you find the perfect chess clock for you!